A symbol of Old Siam, elephants parade across this handsome cup. 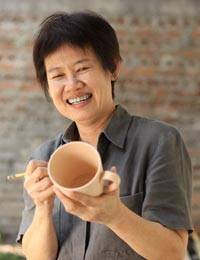 Duangkamol works in Thailand's famed celadon ceramic with its characteristically crackled glaze. The delightful light blue mug is crafted by hand. This piece makes a wonderful gift.